Dealing with the DMV is never fun. In fact, it’s usually just the opposite: boring, tedious, time-consuming and expensive. However, if you’re moving, you can’t avoid it. The DMV will beckon. If you’re moving in-state, there’s good news: dealing with the DMV should be quite easy. You will probably only have to change your address, and you can probably do this online. 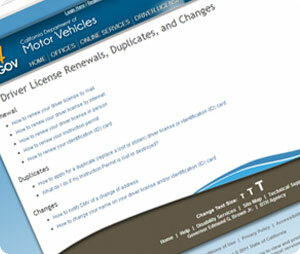 If you move out of state, you will have to conform to the new state’s DMV requirements. Unfortunately, this will probably involve having to go to the DMV to fill out paperwork and, gulp, take a driving test. Some states will also go to the next step and make you take a driving test, a written test or both. Some might also require to pass a vision test. For any state, getting a new license and registration will cost you some fees, sometimes totaling hundreds of dollars. However, these fees are usually cheaper than the tickets you’ll get if you avoid re-registering. Make an appointment – most DMVs offer appointments, but most people don’t make them. Take advantage of this and enjoy being able to walk into the shorter “appointments only” line. Arrive early – people are lazy. It’s a fact of life. If you can get out of bed and to the DMV by 8:30, the lines should be small. If you waltz up at 11:00, you can expect to stand outside for a bit. Use the Internet – making basic, administrative changes, like changing your address and updating your registration, can be done online in just a few minutes. If you are moving to a different state, you might have to hire a service to move your car.